New Delhi, January 12: Diplomats, consular officials with foreign missions in India have called for simplification of processes that entangle and encumber foreign national prisoners (FNPs) in the country. 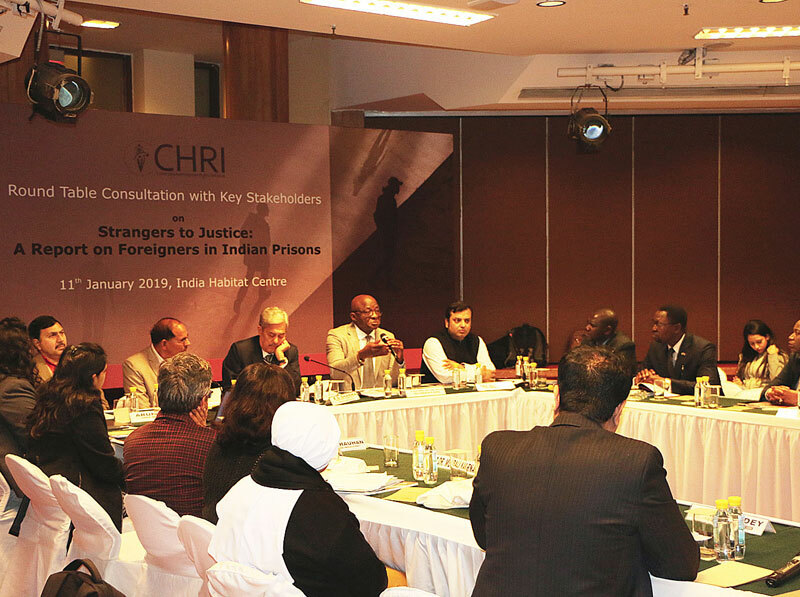 This was at a round-table conference that followed the launch of CHRI’s latest report “Strangers to Justice: A report on foreigners in Indian prisons” on 11 January in New Delhi. The report can be accessed here. The conference looked at issues such as overstay in prisons, lack of contact with diplomatic missions or family, and delays in logistical processes. Participants discussed documentation, nationality verification, and procurement of travel certificates. Stakeholders in attendance included the Ministry of Home Affairs, diplomats from eight countries, civil society organisations and lawyers. “If there were methods to expedite processes and make the emigration process simpler or if smaller offences were waived, there would not be so many Nigerian prisoners in India,” said a Nigerian diplomat. “Strangers to Justice” draws on CHRI’s prison reforms team’s decade-long experience in working with FNPs from more than 20 countries, looks at problems they face in India and includes recommendations to allow them to complete their sentences and be repatriated with ease. Data for the report has been sourced from Right to Information (RTI) requests to heads of prison departments of all 36 states/Union Territories. Problems discussed included the need to bridge communication gaps between prison authorities and FNPs, a reason for which is the language barrier between FNPS and officials. Participants agreed that a pool of interpreters and cooperative lawyers could help expedite the process, and also help foreigners make sense of the documents they are required to sign. Maj-Gen (Retd) Chris Sunday Eze, Nigerian High Commission expressed interest in partnering with CHRI to get both legal and communication help for Nigerians imprisoned in India. Representatives from the Canadian, Australian and Pakistani High Commissions discussed how their embassies had put in place dedicated helplines for families of the incarcerated. Diplomats were also enthusiastic about using video-conferencing to get in touch with incarcerated persons in distant parts of the country. A senior MHA official suggested that both Indian authorities and Embassies would benefit from better communication. “When embassies face issues, they should share them with the Bureau of Immigration or the Joint Secretary of the Consular, Passport & Visa (CPV) Division of the Ministry of External Affairs,” he suggested. For more details, please feel free to get in touch with the authors Madhurima Dhanuka (madhurima@humanrightsinitiative.org) or Palak Chaudhuri (palak@humanrightsinitiative.org).